Banksy’s Grin Reaper print was released in 2005. Unusually for Banksy prints of this time, every one was signed. 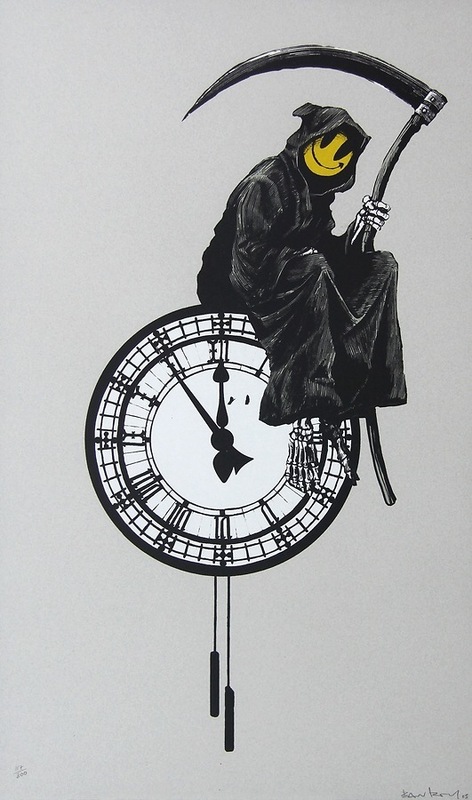 'Grin Reaper' juxtaposes the figure of the Grim Reaper sitting on a clock, suggesting the ‘memento mori’ (remember that you can die) concept - and the iconic ‘Smiley’ face. One of the most recognizable logos in Western society, the 'Smiley' face is associated with the sphere of synthetic drugs - and the idea of positivity and optimism.